Born in the Bronx in 1924, Michael Goldberg began taking classes at the Art Students League in New York at only age 14; three years later, he enrolled in the school run by the Abstract Expressionist painter and teacher Hans Hofmann. However, during World War II, Goldberg interrupted his art studies to enlist in the U.S. Army. 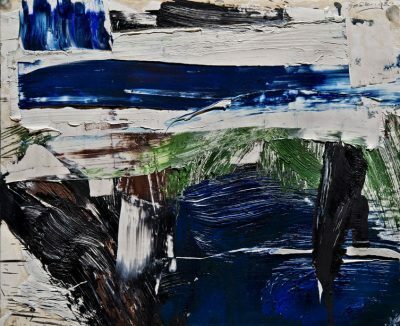 In 1948, he resumed painting with Hofmann and was sub- sequently introduced to the work of Willem de Kooning, Franz Kline, and Milton Resnick. Goldberg met Joan Mitchell around 1951, beginning a nearly three-year relationship with the artist. They spent significant time together in New York City and lived together in East Hampton in the summers. Mitchell scholar Jane Livingston noted that Grace Hartigan believed that “one of Joan’s most important relationship with a man was Mike [Goldberg]. They were together when her art was being formed, and he had a big impact” (Jane Livingston, Linda Nochlin and Yvette Y. Lee, The Paintings of Joan Mitchell, Whitney Museum of American Art, 2002: 20). 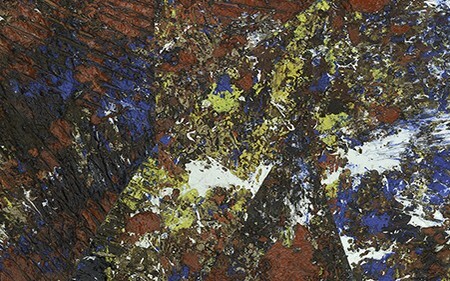 Goldberg participated in the dealer Leo Castelli’s ground- breaking Ninth Street Show in 1951, which included works by Mitchell, Jackson Pollock, and Robert Motherwell; “he seemed to embody the attitudes shared by the artists of that group,” said Richard Kalina of Goldberg (“Michael Goldberg 1924–2007.” Art in America, March 2008). Two years later Goldberg received his first solo show at the Tibor de Nagy Gallery. 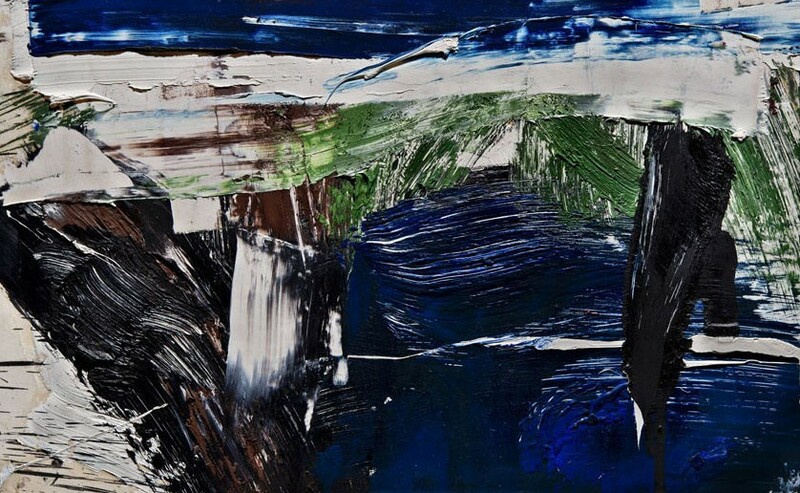 In 1955, Goldberg befriended fellow Abstract Expressionist painter Norman Bluhm, which proved to be a fateful meeting. In 1956, Bluhm brought art collector Walter P. Chrysler, Jr. to Goldberg’s studio, and Chrysler purchased 17 of his paintings. With new interest in his work, Goldberg caught the eye of art dealer Martha Jackson and was soon rep- resented by her gallery. Although often described as a second-generation Abstract Expressionist painter, Goldberg shrugged off these labels, considering them too restrictive and limiting (Chris Scoates, Perpetual Motion: Michael Goldberg, exh. cat., University Art Museum, California State University, Long Beach, CA, 2010). 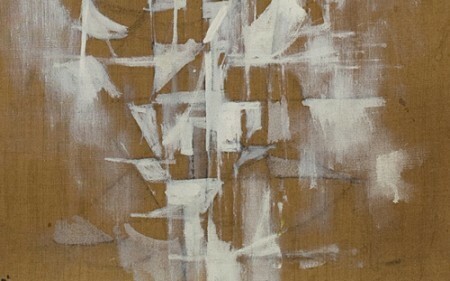 Throughout the 1950s and into the 60s, Goldberg maintained his connection with the Abstract Expressionist painters and was a regular at the Cedar Tavern, known as a meeting place for avant-garde artists. During the 1950s, Goldberg occupied a studio next to that of de Kooning and Resnick and in 1962, he acquired Mark Rothko’s studio at 222 Bowery, where he worked for the rest of his life. 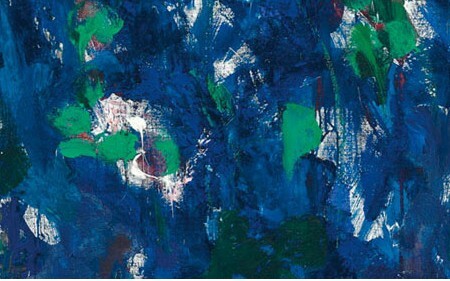 The strong sense of gesture in Two Blues, painted in 1960, characterized by paint sprays and obvious brushwork, relates to Goldberg’s overall body of work, but the cool palette sets it apart from other works. The painting investigates color as well as space and physicality. Goldberg provides the sense of the painting as an object, by building up paint on the paper (his media of choice during the period) and using a palette brush to create texture. This painting appears almost constructed rather than painted and the gestural white brushwork stands out amidst Goldberg’s emotional blues and browns. In total, Goldberg had 99 solo exhibitions since his first show at Tibor de Nagy in 1953. His work is in numerous private and public collections, including the Albright-Knox Art Gallery, Buffalo; the Art Institute of Chicago; the Hirshhorn Museum and Sculpture Garden, Smithsonian Institution, Washington, D.C.; The Museum of Modern Art, New York; the Philadelphia Museum of Art; the Solomon R. Guggenheim Museum, New York; and the Whitney Museum of American Art, New York.